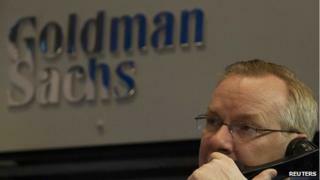 US investment bank Goldman Sachs has reported a big fall in quarterly profits, due largely to a reduction in bond trading revenue. Net earnings for the three months to 31 December fell to $2.33bn (£1.43bn), down 19% compared with the same period last year. But full-year net earnings rose 8% to $8.04bn on revenues of $34.2bn. Rival bank Citigroup also reported results, with its profits also hit by reduced income from bond trading. Citigroup reported adjusted net income of $2.6bn for the quarter, up from the $2.15bn a reported a year earlier but below many analysts' expectations. JP Morgan, which reported its results on Tuesday, also reported suffering from falling or stagnant bond trading volumes. Goldman Sachs chief executive Lloyd Blankfein described the fixed-income market as "a somewhat challenging environment", as US investors prepare for higher interest rates. Goldman's revenue from client trading in fixed income, currencies and commodities dropped 15% in the fourth quarter to $1.72bn. This was partly due to "significantly lower revenues in mortgages", the bank said. But quarterly investment banking revenues rose 22% year-on-year to $1.72bn. Net income applicable to shareholders fell to $2.25bn, or $4.60 a share, over the period, compared with $2.83bn, or $5.60 a share, in the same quarter in 2012, the bank said. The bank paid out $12.6bn in pay and bonuses over the year, down 3% compared with 2012. Looking forward, Mr Blankfein said: "We believe that we are well positioned to generate solid returns as the economy continues to heal and provide considerable upside for our shareholders as conditions materially improve." Citigroup saw its overall revenues fall 2% to $17.9bn for the fourth quarter, due in part to a decline in mortgage loan refinancing volumes. Fixed-income revenues fell 15.5% to $2.3bn, but a rebound in the stock market meant investment banking revenues rose 3% to just over $1bn. In a statement Citigroup's chief executive Michael Corbat admitted that his bank "didn't finish the year as strongly we would have liked", but said it has still made "substantial progress". "We enter 2014 as a strong and stable institution," he said. Shares in Citigroup fell more than 4% as the markets opened on Wall Street. Goldman Sachs shares rose 0.4%. Banking bonuses: How much do they matter?